Island peak is most popular trekking peak in Nepal at an altitude of 6,189 m. If you are wondering where is an Island Peak in Nepal, then the answer is that it is situated in the most popular trekking region of Nepal i.e. Everest region. Because of this, the island peak climbing is most popular as you can combine the Everest base camp trekking with this where you will get the chance to see spectacular panoramic views of world’s tallest peak Mt. Everest. Not only this from the summit of the Island peak you can able to see Mt. Lhotse (4th Highest Peak) closely. More than anything island peak is definitely the lifetime climbing adventure for the first time climber. Day 01: Airport pick up and cultural program with Nepali style Dinner. Day 02: Kathmandu Valley sightseeing including world’s heritage site and trip preparation. Day 03: Direct flight to Lukla and trekking to Namche bazaar starts from here. Day 04: to 5: Trek from Phakding to Namche Bazaar and acclimatization and sightseeing in Namche Bazaar. Day 06: to 8:Trek to Dingboche via Khumjung, Kunde and Deboche and acclimatization. Day 09: to 12:Trek to Gorakshep, climbing to Kala Patthar, trekking to Everest base camp and return to Lobuche. Day 13: to 16: Trek to Island peak base camp via Kong-la pass and Chhukung with acclimatization. Day 17: Trekking and climbing to the summit of Island peak. Day 19: to 20:Trek back to Namche Bazaar via Phanboche. Day 21: to 22: Trek to Lukla and fly back to Kathmandu. Day 23: Farewell Dinner and depart for onward destination. 01 Days Airport pick up and cultural program with Nepali style Dinner. 02 Days Kathmandu Valley sightseeing including world’s heritage site and trip preparation. 03 Days Direct flight to Lukla and trekking to Namche bazaar starts from here. 04 Days to 5: Trek from Phakding to Namche Bazaar and acclimatization and sightseeing in Namche Bazaar. 06 Days to 8:Trek to Dingboche via Khumjung, Kunde and Deboche and acclimatization. 09 Days to 12:Trek to Gorakshep, climbing to Kala Patthar, trekking to Everest base camp and return to Lobuche. 13 Days to 16: Trek to Island peak base camp via Kong-la pass and Chhukung with acclimatization. 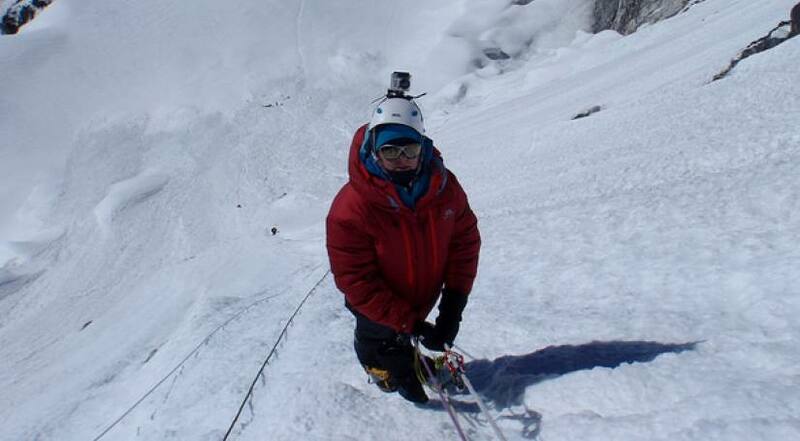 17 Days Trekking and climbing to the summit of Island peak. 19 Days to 20:Trek back to Namche Bazaar via Phanboche. 21 Days to 22: Trek to Lukla and fly back to Kathmandu. 23 Days Farewell Dinner and depart for onward destination.